WP1.1: Geological structure & Mainshock-Aftershock modelling: Geological constraints on seismic hazard, in particular from faults in the Himalaya's complex structural geology. Identification of variable shortening rates in the Himalayan thrust belt using multiple thermochronologic and geochronologic datasets tied to kinematic reconstructions. Modelling of the seismicity sequence using statistical clustering models. Extrapolation of seismic rates over multiple timescales and calculation of time-dependent PSHA to inform WP1.2. Selection of mainshock-aftershock sequences for Nepal to be used for the numerical and experimental investigations of WP3. WP1.2: Fault rupture- and wave propagation-based Seismic Hazard Assessment: Mapping of the variability of shaking, including topographic effects, landslides and liquefaction, in sufficient detail to quantify the hazard and risk from future earthquakes in Nepal. Novel combination of numerical simulations of kinematic fault ruptures, and linear and nonlinear wave propagation. WP1.3: Rapid soil assessment: Development of correlations of basic soil parameters with more complex ones as a means for rapid assessment of the stiffness reduction of soils and a more reliable prediction of soil-dependent school building vulnerability. Use by recent laboratory databases correlating reductions of shear moduli (G/Gmax ) with plasticity index for fine grained materials and sands. Sample spatial distribution of soil properties (Vs,30 tests). WP2.1: Data Center A continually expanding comprehensive Data Center with the aim to turn into a national asset and resource, ground motions (WP1.1), seismic hazard (WP1.2), soil database (WP1.3), pre-quake school inspection data using the mobile agent (WP2.2), documented school building construction cases, typology inventory of the most characteristic structural systems and materials used for schools buildings in Nepal (R/C, reinforced masonry, unreinforced masonry, adobe, rumbled earth, hybrid etc), existing retrofitting techniques with their respective cost, and archetypal examples for numerical & experimental investigation. WP2.2: Mobile app for pre- and post-earthquake inspection: Novel, intelligent, mobile-based expert system, particularly tailored to Nepal. 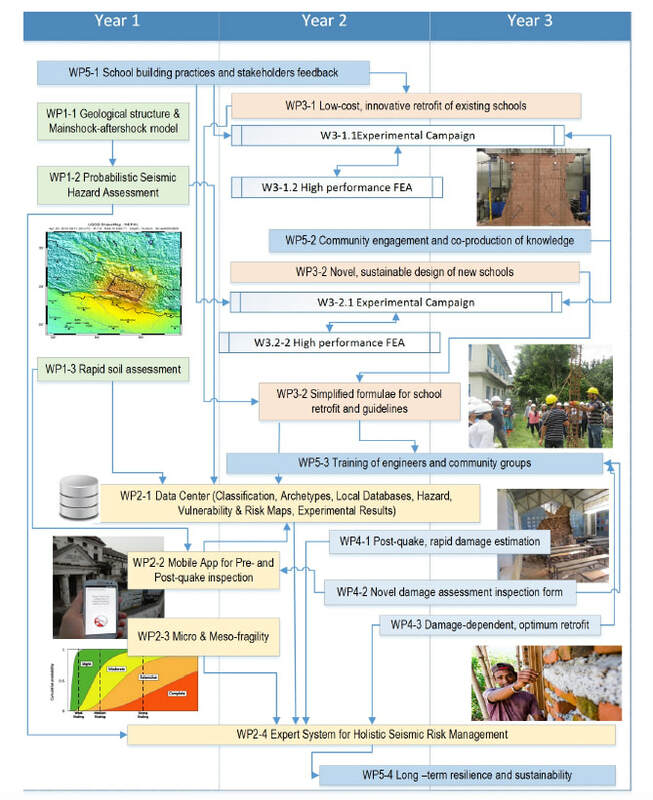 Progress beyond the existing ATC-20 models by introducing a dual Probabilistic & Deterministic Multi-level modelling of hierarchical data for rapid pre-disaster school building screening and post- disaster building evaluation for safe occupancy. Core logic will build upon the existing Structural Integrity and Damage Assessment (SIDA) developed by AID and the World Bank for the Department of Education. WP2.3: Pre-quake micro and meso-fragility modeling: Shifting from the high resolution building-by-building inspection to probabilistic vulnerability of class of school buildings for DRR. Development of a bespoke micro- and meso-scale approach for non-structural masonry infills typical of the Nepalese building stock that includes the uncertainty in local quality control. WP2.4: Expert System for Risk Management: Development of a holistic, GIS-based collaborative framework that facilitates a hierarchical pre-quake strengthening using (WP2.2) for prioritizing the schools for occupancy and recommends low cost-high efficiency repair/retrofit based on the large scale experiments results (WP03). WP3.2 Novel, sustainable design for new school buildings: Production of a novel foundation, including a cheap and locally sourced low-frictional material within a pair of concrete slabs. Experimental exploration of the performance (geotechnical, tribological, rheological) of these novel granular composites, to determine the minimum range of friction coefficients that are practically obtainable. Investigation of the mechanical behaviour of multi-phase soil-lubricant composites through a dynamic shear box (for a range of normal stresses) and odedometer tests under different boundary conditions. Forensic exploration of the low order nonlinear slip-stick models using numerical continuation to characterise nonlinear backbone curves, nonlinear resonances, and nonlinear frequency/amplitude dependencies for a complete range of system parameters. WP3.3 Simplified formulae for school retrofit and guidelines for innovative new construction: Guidelines for engineers, stakeholders (i.e.,STC, NSET and DOE) responsible for school construction to illustrate the steps for the strengthening and construction methods (WP3.1,3.2). Update of the existing Nepalese Mandatory Rules of Thumb (MRT) for designing load bearing masonry structures. WP4.1 Post-quake, rapid damage estimation methodology: Adjustment of the spectral-based FAST methodology for quick estimation of damage states expected in Reinforced Concrete (RC) buildings with masonry infills for the Nepalese building stock (WP2.1) and earthquakes (WP1.1) using the current damage/usability form employed by NSET for input data. WP4.2 Novel damage assessment inspection form: Development of a joint usability/damage survey form fitted for the Nepalese case. Data collection, surveys, and interviews aimed at getting direct information on usability/damage and short-term provisional retrofit employed at local level. Correlation of the damage usability form with the post-event data of 2015. Implementation of the damage assessment into the app (WP2.2). WP4.3 Damage-dependent, optimum retrofit: Identification of the optimum retrofitting strategies (WP3), for different damage levels and modes of failure. Integration with the damage assessment framework (WP4.2, 2.2) to provide an expert system that for local engineers to select the most appropriate retrofit techniques. WP5.1 Current school building practices and stakeholders feedback: Multiple visits to Nepal for stakeholder engagement and to understand the current construction practices, challenges and limitations before populating the database of structural typology (WP2.1, W2.3) and designing the experimental campaigns (WP3). WP5.2 Community engagement and co-production of knowledge: Organization of workshops in selected regions for local engineers, specialist and community groups. Such dialogues will also facilitate the understanding of possible future scenarios that may unfold from different drivers (e.g., population growth, urbanisation, etc. ), as well as interacting multi-hazards. Identification of the most effective measures to be implemented. WP5.3 Training of engineers and community groups: Series of workshops in Nepal for the local engineers and community groups. Providing a vehicle for the dissemination of co-produced resilient design of school buildings. Training on quick visual inspection of buildings, (WP2.2), the implementation of good low cost retrofitting techniques (WP3). WP5.4 Pilot application: Test of mobile expert system agent (WP2.2, W2.4) for the case of two regions, one rural and a part of Kathmandu for validation, calibration and training purposes. Assessment and rehabilitation of an existing school (WP3.1) as well as design of a new school with the novel natural isolation method (WP3.2). WP5.5 Long–term resilience and sustainability: Development of a systems thinking framework and tools in adequate scenario assessment and resilience development from a harmonised and multi-disciplinary perspective. Strategic planning to ensure resilience in the wake of future hazardous events. Building upon the knowledge gained during WP5.1-WP5.2, development of pre-quake risk mitigation plans and post-quake recovery strategies towards resilient educational communities. Implementation of the new knowledge gained through the SAFER project in all aspects of the resilience circle, from everyday practices to governmental policies. Integrational workshops for innovation dissemination.